Spectacular patriotic wall map of the United States illustrating the Republic of Texas. Phelps and Ensign's travellers' guide, and map of the United States, containing the roads, distances, steam boat and canal routes and c.
A very patriotic piece, this spectacular 1841 decorative wall map of the United States was prepared New York firm of Phelps and Ensign. The highly appealing production covers the United States from the Rocky Mountains to the Atlantic Seaboard and from Green Bay and the Straits of Michilimackinac to the Gulf of Mexico. This map was issued during the Republic of Texas period and Texas is thus illustrated with its pre-statehood boundaries. This map also predates the Mexican - American war, so Mexico occupies all lands west of Texas and the Missouri Territory. Roadways and mileage are often noted. Thirteen insets detailing major ports appear in the lower right quadrant of the map proper. To the left of the main map are statistical tables illustrating the world's great rivers, the world in hemispheres, comparative mountain heights. There is also a key to the large illustration below. All of the signatories of the Declaration of Independence are accounted for with their signatures reproduced. The working of the Declaration itself is also reproduced. 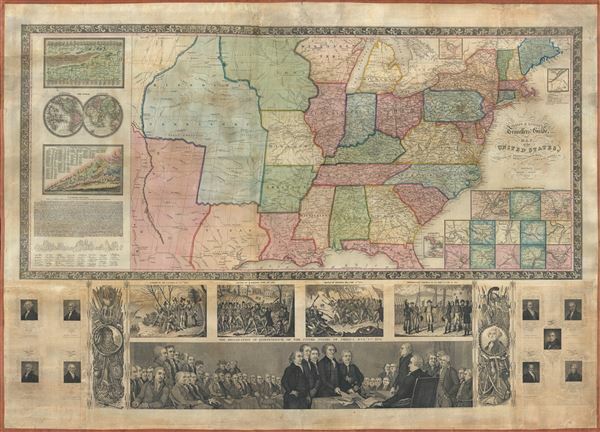 The highlights of this map are the elaborate engravings that illustrate the lower quadrants. These include historical images of the pilgrims landing in 1620, the 1775 Battle of Lexington, the Battle of Bunker Hill, and Washington's 1783 farewell to the army. The largest illustration, filling the bottom of the map, depicts Thomas Jefferson, Benjamin Franklin, and other signing the Declaration of Independence on July 4, 1776. To either side of this image, culturally themed martial illustrations depict George Washington (right) and King Philip (left), an American Indian Sachem also known as Pometacom who lead an Indian uprising against English Colonists in 1676. Further illustrations include portraits of the nine American presidents up to William H. Harrison. Harrison was elected president in 1840 but died in April of 1841, just one month after taking office - marking this map as an exceptionally ephemeral production. Phelps and Ensign first issued a map of this title in 1839 and terminated at the Mississippi. The present example, presaging the Mexican American War and Texas Annexation, is dramatically expanded to include the Rocky Mountains and additional illustrations. Various were issued in 1840 and, as above 1841. This map is a steel plate engraving prepared for Phelps and Ensign by J. Wells of Brooklyn, then not yep incorporated into New York City. Very good. Professionally restored and backed on fresh linen. Missing original rollers. New rollers can be manufactured upon request. Boston Public Library, Leventhal Center, G3700 1840 .P5. New York Public Library, Map Div. 01-5146. OCLC : 47017064.